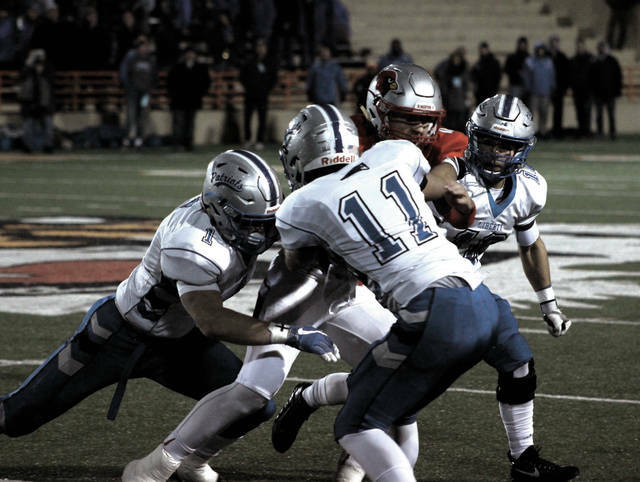 A trio of Olentangy Liberty defenders, led by Skylar Wahlund (1) and Nick Paolo (11), converge on Mentor quarterback Tadas Tatarunas during the first half of Friday’s Division I state semifinal at Arlin Field in Mansfield. Mentor quarterback Tadas Tatarunas is known for his big arm. He used that and his legs to lead the Cardinals to a 27-21 victory over Olentangy Liberty in a Division I state football semifinal Friday night at Arlin Field in Mansfield. Tatarunas, who had just shy of 3,000 yards this season, threw for 133 in the third quarter alone after being held to just 69 yards in the first half. He finished with 251 for the game on 22-for-32 passing with a touchdown and an interception and added 78 yards on the ground on 20 carries with two more scores to lead the Cardinals. He found Logan Shea for completions of 15 and 25 yards – the latter of which set up Tatarunas’ own 3-yard run to give the Cardinals a 21-14 lead with 3:24 left in the third quarter. Shea finished with 96 yards receiving on seven catches and added 34 yards rushing on four carries. Mentor wore down the Patriots on a 20-play, 95-yard that consumed 7:47 off the clock. It started in the third quarter and ended with a Tatarunas 1-yard TD run to give the Cardinals a 27-14 edge with 5:40 left after the missed extra point. Liberty QB Mitchell Okuley completed five passes, including a 17-yarder to Johnny Wiseman in the back of the end zone to cut Liberty’s deficit to 27-21 with 3:06 left. Liberty did have one last shot, but Okuley’s 25-yard pass was just overthrown to Wiseman on a fourth-down play with 0:42 left. Three Tatarunas completions on Mentor’s first drive of the second half set up a Chris Edmond 1-yard run to push the Cardinal lead to 14-6 with 7:25 left in the third. But, Liberty came right back. Aiden Kinley returned the ensuing kickoff 70 yards. Then, Okuley found Ben Roderick in the slot for a 23-yard touchdown with 7:05 left in the third. Okuley fed Wiseman to tie it 14-14 on the two-point conversion. Okuley went 19-for-36 for 193 yards and two scores. Roderick caught six passes for 93 yards and a touchdown. Wiseman led with 69 yards rushing on seven carries and Matt Webb added 48 on 12 carries for the Patriots. Liberty used a 14-play, 80-yard drive that took 4:58 off the clock to take the early lead on a Webb 1-yard run on its opening possession. The extra point was blocked, but the Patriots had a 6-0 lead. Mentor (13-1) responded with a 23-yard touchdown pass from Tatarunas to Matt Hartman to cap a short three-play, 36-yard drive on the Cardinals’ second possession to take a 7-6 lead with 0:12 left in the first. Hartman had six catches for 78 yards receiving and Luke Floria added 53 yards for the Cardinals. Liberty (11-3) didn’t take advantage of an apparent gift after a muffed punt by Shea appeared to be recovered out of bounds. The Patriots got it, though. But, two plays later, gave it right back on a bad snap. Liberty had outgained Mentor 150-104 in the first half. But the Pats were penalized nine times for 98 yards to keep them behind the eight ball. All told, Liberty was penalized 11 times for 112 yards and Mentor had 11 penalties for 93 yards. Mentor faces Pickerington Central for the state championship either Thursday or Friday at Tom Benson Hall of Fame Stadium in Canton.